Welcome everyone to THE EARFUL, a delicious piece of new content from the minds over at the OH NO RADIO SHOW. This bonus show will feature a countdown of songs we have been enjoying within our ONRS community giving you all a taste of musical variety and maybe even turning you onto to something you'll like! We hope to do these shows often and would love your feedback and input as well on what we should be listening to. 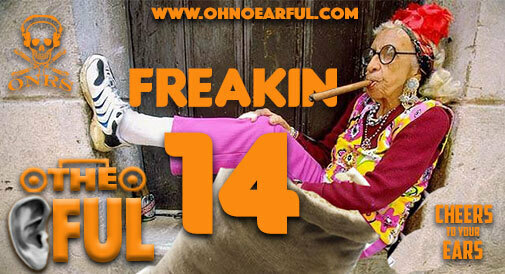 So let's cut to the good stuff and fire up episode 14 - FREAKIN' FOURTEEN of The Earful! The Wild Magnolias are a Mardi Gras Indian tribe who also record and play as a funk musical act from New Orleans, Louisiana. Chon is an American math rock band from San Diego, California. Their music is largely instrumental-based with only a few songs containing vocal performances. Make sure to check out all the past episodes of THE EARFUL over at OUR PAGE RIGHT HERE! Stay tuned for future episodes and make sure to check out these artists online if you liked any of the tracks you heard on today's show. Also if there are songs, artists or albums you think we should be listening to please leave them in the comments! This entry was posted on Monday, July 17th, 2017 at 2:54 pm	and is filed under DefaultTag.